Compact fluorescent lamps have been billed as an energy-efficient means for reducing carbon emissions, and the so-called CFLs have steadily displaced the traditional incandescent light bulbs on store shelves in the United States as our government has banned the manufacture or importation of the latter. However, like many consumer advocates and product safety specialists, San Francisco products liability attorney Gregory J. Brod has concerns over whether the new technology is all that it has been hyped up to be or even safe. The now-recognizable spiral-shaped CFL was first invented in 1976 by Edward E. Hammer, an engineer with General Electric, in response to the stateside pinch in energy supplies that was caused by the 1973 oil crisis. In 1980, Philips introduced its model SL, which was a screw-in model of the CFL, and in 1985 Sylvania began to market it model EL lamp, which was the first CFL to feature an electronic ballast. Work on newer models strived to develop a CFL that would be able to fit into the same volume as comparable incandescent lamps, which required a bulb with high-efficacy phosphors that could withstand more power per unit area than the phosphors older-generation large fluorescent lamps employed. CFLs are not designed for outdoor use and will not start in cold weather. In addition to the aforementioned shortcomings of CFLs, there are also concerns related to health and the environment. 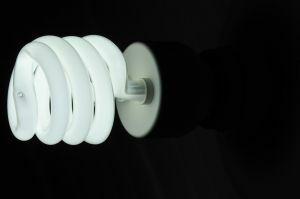 For example, CFLs may pose a health risk to people who suffer from skin conditions due to the ultraviolet and blue light that the bulbs emit; a European Commission scientific study found that CFLs could produce ultraviolet exposures that approach current workplace limits in force to protect workers from skin and retinal damage. In addition, a recent study found that exposure to CFL light caused significant cell damage in cultures; further analysis confirmed the presence of significant UVA and UVC radiation, which the study thought might be attributable to damage in the bulbs’ internal phosphor coatings. Should the base of a CFL not be made to be flame-retardant, which is required in voluntary CFL standards, overheating in electrical components in the bulb may cause a fire hazard. And, as in the case of any other light bulb, if a CFL breaks there will be quite a mess to clean up, a hazardous situation that is not limited to glass shards in the case of a CFL – like all fluorescent lamps, CFLs contain highly toxic mercury as vapor inside the glass tubing, which is released into the atmosphere when a CFL breaks. Any CFL that makes it through its lifespan without breaking may very well end up broken in landfills if proper disposal techniques recommended for CFL cleanup and/or disposal are not followed. At the Brod Law Firm, our team of lawyers feels that the jury is still out on the efficacy and safety of the relatively new technologies found in CFLs. We hope that no one is sickened or harmed in any way by the new bulbs, but anyone who feels that have been harmed or injured in this way is invited to contact us for a free consultation.